I find earthenware the most seductive clay body. Using this chocolate porcelain, I create tableware to be integrated with the dishes you already use. 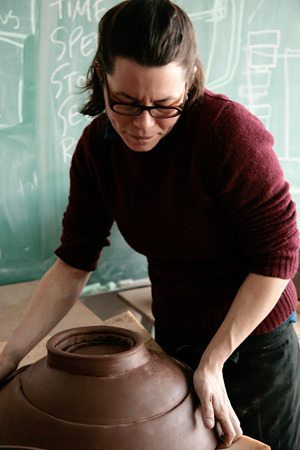 I seek to evoke nostalgia of the future by making pots that are reverberations of the past. I draw inspiration from early English porcelain and cream ware. Concepts and graphics of Italian Renaissance maiolica and Persian slip-ware are the building blocks of my surface treatment. I provoke a tension between the elegant handling of the material and the rugged connotations of the clay body. Pottery performs dual roles of utility and decoration, simultaneously serving as containers of social and cultural information. Ceramics persists as a chronicle of cross-border influences and the exchange of aesthetic information. My pots typify our infinite access to information and images from throughout the world. I am particularly drawn to the semiotics of objects – the message they may contain by visual inference and juxtaposition. Creation is a unity of cognition and action. It is a continual process of call and response. While at work, I am asking questions that consistently inform the next series of work. Inquiry stems from and is propelled by my interactions with the material, imagery, historical research, my past pots and future ideas. As a maker, I have the capacity to exploit the variables of surface, form and scale to instigate a particular experience. The work teases the boundary between awkward and sophisticated. I play games with lines and colours. Strategies of ornament are developed to engage and enhance the piece. Whether home alone, or at a table laid for a feast, I want my work to promote conviviality. I make pots to be enjoyed among those fond of eating, drinking, and good company.